Yes, you can keep these plants alive. Really. Some might call my love for plants a hobby, but I’m pretty sure it’s more than that now. With the 50+ plants I have in my classroom, it’s kind of a full-blown obsession. There are so many good reasons to have classroom plants. Not only do our potted friends add a bit of nature and look nice in a school setting, but they’re also a great way to engage kid into science lessons and work on their responsibility. Not to mention, they purify the air in ways your Glade plug-in only wishes it could! Now you do have to be a little careful with plants in the school setting become some can be dangerous and poisonous to kids. Others won’t respond well to the dungeonesque lighting situation you most likely have going on. So here are my picks for the top five classroom plants. They’re easy to grow, and will look great year-round. They’re cute. They’re sweeping the nation. And you can literally find them everywhere. But does that make them easy to grow in the classroom? Maybe. Don’t let succulents intimidate you. Just keep a few rules in mind. First, choose the GREEN ONES. Girl are you listening to me? I know the purple ones are tempting. I know the red hues of the others will go amazing with your classroom theme. But green is the way to go. They do better indoors. They just do. Deep, rich greens are even better. Now if you have a poorly lit classroom for this (or other indoor plants), you’re going to have to supplement. This means picking up a cheap grow light on Amazon or changing the lightbulbs in a simple lamp to grow bulbs instead. Water these plants sparingly. Succulent leaves are puffy for a reason. They are holding water for the plant. Keep this in mind when you get tempted to give them a heavy soak for the weekend. Don’t do it. The succulent world is big, right? My two personal favorites to grow are aloes and haworthias (some varieties are called the zebra plant). Both thrive with neglect and would prefer that you forget they’re even in the room. Think of them as the shy kid at the school dance. You can shine the spotlight on them, but they’re just going to awkwardly gyrate and be scared for life. However, if you leave them alone, they’ll find their place in the world and be more successful overall. Ahh, the plant of the year. I swear these things are popping up in interior decorating magazines left and right. Growing a fiddle (Ficus lyrata) in the classroom will for sure give off that HGTV vibe. Everybody always thinks these massive beauties are difficult to take care of, but they’re really not. Like most houseplants, the roots prefer to dry out (though not completely) before they get a full soaking again. Don’t overwater, though. The trickiest part of these plants is their light needs. These broad-leafed beauties love themselves some bright, (and I do mean BRIGHT) light. This does NOT mean full sun though. They still need diffused, indirect light …they just like a lot of it. I once had a fiddle named Patsy, and she wasn’t looking so good. Then I tried using some grow bulbs on her, and she perked right up. She just wasn’t getting enough light in my small apartment with a north-facing window. A couple more tips for growing fiddles. With this plant, you’ll also want to take note of the pot or planter size. It might be a large plant, but this doesn’t mean it should be in a large pot. Actually, it’s the exact opposite. Fiddles like their roots to be “hugged,” so keep the container a little smaller. You should probably also keep it in the pot it came in for four to six months before transplanting it into a larger pot. Now this might seem like a lot of rules, but it’s really not that involved. Just note that where there’s a will there’s a way. These are popular with students, and they are extremely easy to care for. You can find them in most garden centers or even home decor stores since they’ve become very popular for giving that peaceful Zen feeling. Mostly, you just need to make sure its vessel is always full to the brim with water. You’ll want to place these plants in medium to low light. Badda Boom! You’ll have yourself a healthy lucky bamboo shoot …or 12. As a bonus, this is also a great plant to have around if you’re teaching about pandas. I’m obsessed with air plants. They can really take your classroom from drab to fab when you scatter them around the room. A lot of people don’t even realize these are real plants because you don’t need soil for them. But they’re amazing, and here’s why. First, there are so many options to choose from. You can find air plants the size of a nickel or as big as a dinner plate. Some are stick-like with arms growing in various directions while others have fat leaves that curl back. You can also find them in multiple colors. 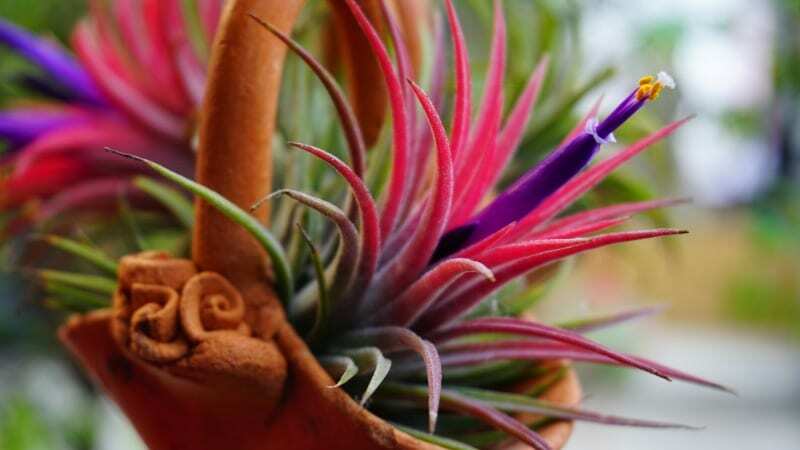 My favorite air plant is called Tillandsia Bulbosa (that’s the botanical name). The arms remind me of Ursula from The Little Mermaid. Next, air plants are great because they’re so easy to care for. They mostly need a well-ventilated area. And the more light you can give them, the better. Feel free to experiment with their placement, but bright lights are probably best. So how do you water these plants if they have no roots and there’s no soil? You just soak them for 15 minutes or so and then put them back in their spot. You can place then in cool hanging bulbs or mini pots. If you do a search on Pinterest for “air plant arrangements,” you’ll quickly go down a rabbit hole of creative ideas. It just sounds like a happy plant you’d want to grow, doesn’t it? 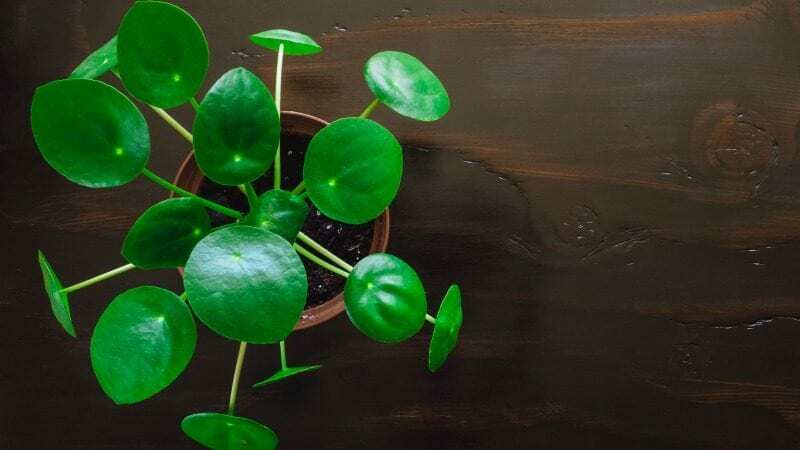 Also called the money plant, look for this one by the botanical name of Pilea Peperomioides. This plant is SUPER fun and very enjoyable for your kids as well. They are easy to propagate, making a completely new plant from an existing one. This makes them easy to share with your closest friends. When cared for properly, the friendship plant will start to form babies (or pups) at the base of their stem. You can let them grow out, which will create a much more full looking plant, or you can carefully cut them free from the mother plant, place them in water and let them start to grow roots of their own! The kids in my classes have LOVED when my pileas have produced pups and always get very excited to take home a propagated trimming. These plants can be a little more particular about their environment. They like to have their soil dry out completely before watering. Keep and eye on the soil. When you stick your finger in one inch or deeper, and it still feels bone dry, you’re probably good for another watering. Here’s a quick fun fact. These plants are technically part of the succulent family! This means they LOVE sun, but just not as much as their succulent cousins. Bright and INDIRECT light is the key here. 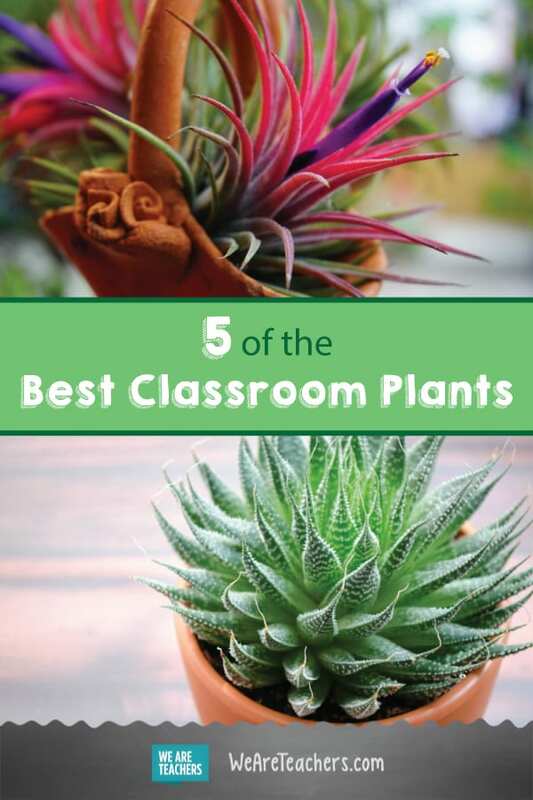 What are you favorite classroom plants? Share it with us in our WeAreTeachers HELPLINE group on Facebook. Plus, here are some creative ways to teach about plant life cycle. Fun, passionate and engaging are three words that clearly describe Joe, AKA Mr.D! His commitment to student engagement has captured the hearts of many teachers, not only through his viral spelling test video, but also through his appearances on The Ellen Degeneres Show!